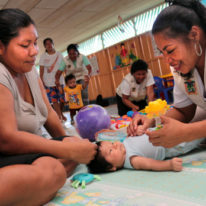 Governments around the world are currently formulating quality standards for early childhood services. When delivery models are multiple and diverse, as is the case across much of South and South East Asia – including publicly funded, private and community-based – defining quality standards is especially crucial. Standards set out clear expectations for what knowledge and skills early childhood workers should have, and how they should go about their work with young children and families. Sometimes they only define minimum conditions; sometimes they lay out pathways for service providers to improve their levels of quality. In India, for example, the quality standards framework is based on the National Early Childhood Care and Education (ECCE) Policy 2013 (Ministry of Women and Child Development, 2013, 2014). 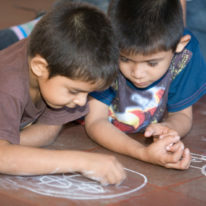 It identifies some non-negotiable minimum standards for crèches, preschools and other early childhood service providers, such as at least one trained adult for every ten children aged under 3, and at least one for every 20 children aged 3–6; an age-appropriate, child-centric curriculum in the children’s mother tongue; and availability of child-friendly toilets, safe drinking water and a separate space for preparing meals. However, it also makes clear that these ‘non-negotiable’ minimum standards are not sufficient for a service to be considered good quality. Service providers are encouraged to work to meet the indicators specified in the quality standards framework. These indicators are grouped under eight ‘standards’, each broken down into elements. For example, elements of the first standard – ‘interactions’ – include children’s interactions with their peers, teachers and environment, and staff interaction with families and with each other. Examples of indicators include ‘caregivers encourage children to think, reason, question and experiment’, and ‘children are encouraged to negotiate and resolve conflicts peacefully with adult intervention and guidance where necessary’. Other standards and indicators cover areas such as washing hands before meals, adequate outdoor space, availability of books, record keeping and many others. The quality standards also propose the establishment of a national registration system for all ECCE service providers, with mandatory registration, evaluation and accreditation. However, at present this remains only a proposal – it has yet to be implemented at national level. Stepping into the gap, some state governments are establishing their own oversight institutions: for example, Himachal Pradesh proposed a bill in 2017 to set up a body with wide-ranging powers to regulate private provision of playschools, nurseries, crèches and preschools, while Telangana is establishing a state-level council with responsibility for private institutions serving children aged below 6 years of age. Elsewhere in the region, there are examples of mandatory registration systems in place. The box describes two such systems, in Singapore and the Philippines. The Early Childhood Development Agency (ECDA), set up in 2013, oversees kindergartens – including nurseries and playgroups, for children from age 2 to 7 – and child care centres, which can cater for children as young as 2 months. The agency is multi-sectoral, run jointly by the Ministry of Education and the Ministry of Social and Family Development. Its quality assurance model looks at seven issues: leadership, planning and administration, staff management, resources, curriculum, pedagogy, and health, and hygiene and safety. It is mandatory for providers to register with the ECDA, and they must show that they meet the baseline requirements of quality to receive a license to operate – a process which involves visits from regulators. 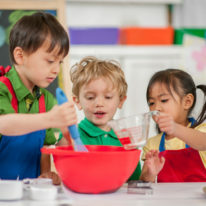 Having done so, providers can look at indicators in the ECDA’s Quality Rating Scale to see if they would qualify for a certificate from the Singapore Preschool Accreditation Framework – if so, they can apply to be evaluated through a process of classroom observation, interviews and document checks. The Early Years Act of 2013 gives responsibility for overseeing services for the birth to 4 years age group to the Early Childhood Care and Development Council, with the Department of Education taking over once children reach the age of 5. The Council has a high-level, multi-sectoral governing board chaired by the Secretary of Education and including the Secretaries of the Department of Social Welfare and Development and the Department of Health, the Executive Director of the National Nutrition Center, and the President of the Union of Leagues of Local Authorities of the Philippines – along with an expert in the field directly appointed by the President. 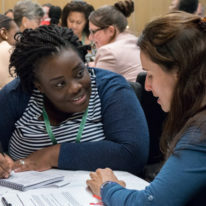 "Development of quality standards needs to go alongside development of tools for measuring and rating the quality of programmes, learning and caregivers.’"
Standards need to be defined in a way that creates clarity about what a service provider needs to do to achieve them, with a comprehensive and clear set of indicators that can be followed progressively. Where standards are mandatory, service providers may need to be provided with time and technical support to meet them. Support may be most effectively provided by sub-national levels of government, such as provincial or district. Development of quality standards needs to go alongside development of tools for measuring and rating the quality of programmes, learning and caregivers. Useful resources here include the tools developed by ECDA in Singapore for accreditation; the Early Childhood Quality Assessment Scale developed by the Centre for Early Childhood Education and Development in India; and the World Bank’s Systems Approach for Better Education Results. Central agencies on early childhood have the potential to provide focused technical guidance on development and implementation of standards, as is the case in both Singapore and the Philippines. Establishing a council at central level ensures a well-coordinated approach to quality assurance. While ideally one set of standards would ultimately apply to all service providers, it may initially be necessary to recognise different contexts in the setting of standards. 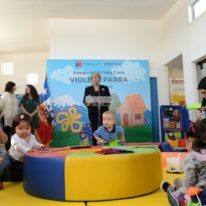 For example, community-based preschools in remote regions of countries such as Lao PDR and Timor-Leste could struggle to meet standards that might be appropriate for publicly funded or private preschools in urban areas. Social inclusion must be recognised as an underlying quality dimension that cuts across all the other dimensions. Ultimately, the successful implementation of the standards will depend on strong legislative frameworks, adequate financial commitments, capacity building of stakeholders in the sector and a strategic collaborative approach involving communities, governments at all relevant levels, civil society, development partners and private sector.